It was Sunday evening, and Happy Meal and I had another Groupon to use. I had purchased one for Mandy's Family Restaurant due to the numerous mentions of burgers in the offer. We made our way down to El Segundo, where the living was easy, and the street parking was free. Finding free parking was the absolute highlight of our visit. Mandy's was understaffed with a single waitress for the 10 tables. The owner wandered in and out, but was largely invisible. We ordered a couple of cheeseburgers and an appetizer. About 20 minutes later, 2 cheese-free burgers arrived. I mentioned that we had ordered an appetizer and that we wished to cancel that part of the order, since it no longer made an sense. Naturally, the server brought out that plate immediately. I reiterated that I was no longer interested in the appetizer, since it was arriving after the main course. Her reply was a huff and a surly eye roll. It was only then that I realized that "cheeseburger" was a misnomer for what I had ordered. I summoned the manager over, and he trotted the plates back to get some cheese on the burgers. 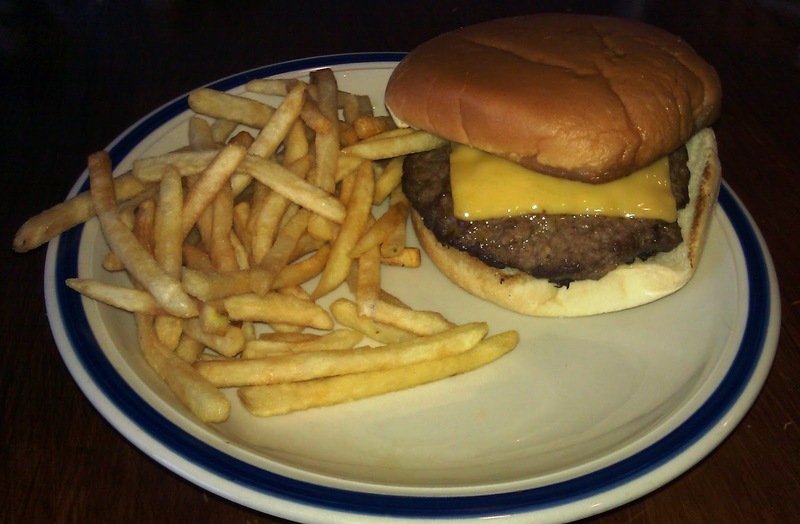 The kitchen was so sloppy, that the barely melted cheese on my burger had a fry trapped underneath it. So.....bang up start. The Beef: The beef at Mandy's Family Restaurant was of a grade that could best be termed "3rd World Industrial." The beef in this burger had me pining away for airline food. The patty weighed in at around 2 ounces. It had the texture, thickness, and general culinary appeal of an athletic shoe's insole, but it had less flavor. The patty was bowed like a murky contact lens. The grind was intensely fine, and the vulcanized patty was so dry that it was like beef jerky with none of the beef flavor. The burger was bland to the point of tasting watery. The highly processed, machine-formed, previously-frozen frisbee of a patty still had clear conveyor belt marks on it from whatever factory is was shipped in from. Epic fail. The Sear: A hearty yet utterly pointless sear was applied to part of one side of the burger patty. The sear further contributed to the dessicated nature of this burger. The Preparation: In terms of heat and pressure, the burger at Mandy's Family Restaurant was well its the way to being turned into a diamond. The lukewarm fries, unmelted cheese, untoasted bun, and otherwise shoddy preparation spoke to a level of incompetence in the kitchen that made me question the wisdom of allowing Happy Meal to take another bite. He made that decision on his own and set aside the dry disc of shame and despair after a few bites. My son is ordinarily a bit of a human garbage disposal, but Mandy's served up a meal that even my sturdy and ravenous lad couldn't choke down. The Cheese: The unmelted slice of American cheese was just that. It was lost in the blandness of inferior, stale-tasting ingredients. The Bun: This was an over-sized, stale, cool, barely toasted industrial grade bit of nonsense. The cook had slid/wiped the bun halves across the griddle so that the grease had built up on and soaked into the leading edges. The bun was bland and dry. The Meat To Bun Ratio: The dry, stale bun overpowered the thin, dry, chewy, bland burger patty. It was like eating a piece of furniture from Ikea. The Toppings: Who cares? It was all bad at Mandy's Family Restaurant. The Fries: Lukewarm, bland, unseasoned, and just plain not good. Sadly, the fries were the best thing on the plate. The Value: We spent $7 for $14 worth of unpalatable, inedible garbage. This was a sinful waste of 7 bucks. The cheeseburgers at Mandy's Family Restaurant were the sort of thing that would cause prisoners to riot. There was simply nothing redeeming about the burgers. The service matched the food. The surly twerp of a waitress failed to check in with us at any point after taking our order. 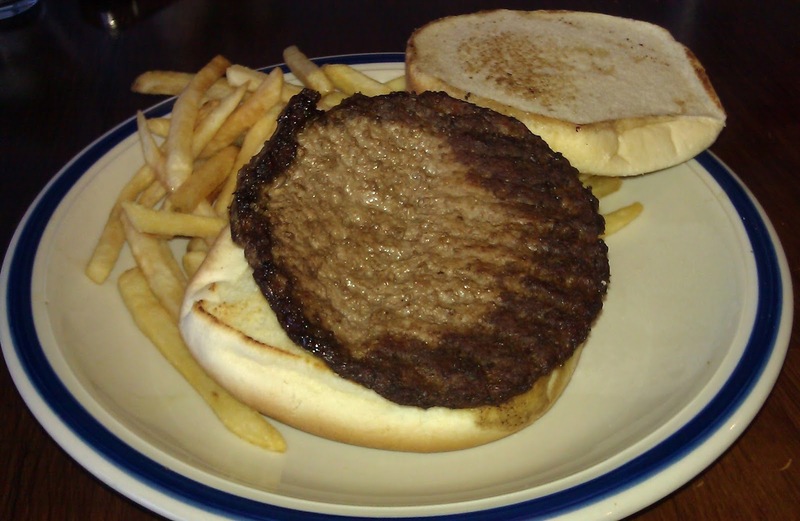 Burger Review : The worst burger in the Los Angeles area can be found at Mandy's Family Restaurant. Never again--not even on a dare. hey Pete! thanks for the head's up! I was thinking of planning my family's next vacation around this place . . . .
Hahaha---coffee just came out of my nose. Mandy's had the merit of novelty. They were serving up a lot of pancakes at 7 in the evening....that should have been a good enough clue. The brutal part was wasting time and money on that nasty thing. Great review though, especially the caustic brilliance of The Beef paragraph. You're sorta intense. The Jonathan Edwards of burger reviewers. I have to tell you, most reviews are boring to write, and I imagine that they are boring to read. It's the excellent and the awful burgers that are fun to write about. I ordinarily let a review percolate for a couple of days before I type it out. In the case of Mandy's, I had it written in my head before I got home.